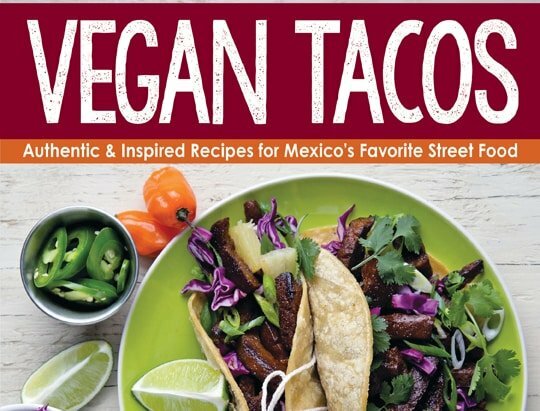 When I was asked to review Vegan Tacos by Jason Wyrick I didn’t imagine that a book on tacos could be this extensive. It gives the history of tacos, teaches you to make your own tortillas, make a variety of fillings, toppings, sides and even drinks! Please note that the publisher gave me a copy of the book, but all opinions are my own. There are affiliate links in this post which means if you buy through my link I will receive a small commission. This book is like going off to college and majoring in tacos. I already have recipes marked for later (maybe I’ll even start joining everyone in taco Tuesdays!). There are tons of beautiful photos and the recipes are clearly written. There is a good balance between easy to find ingredients and ingredients you might find in the Hispanic section of your grocery. It’s a great inspiration to try some new foods. This part contains chapters 4 – 13 and has the bulk of the recipes which includes recipes to make your own vegan chorizo, seitan. There are vegetable, cactus, mushroom and combos you’d never think of on your own. Jason even has some fusion and dessert tacos! This section is full of items that can take your taco over the top. 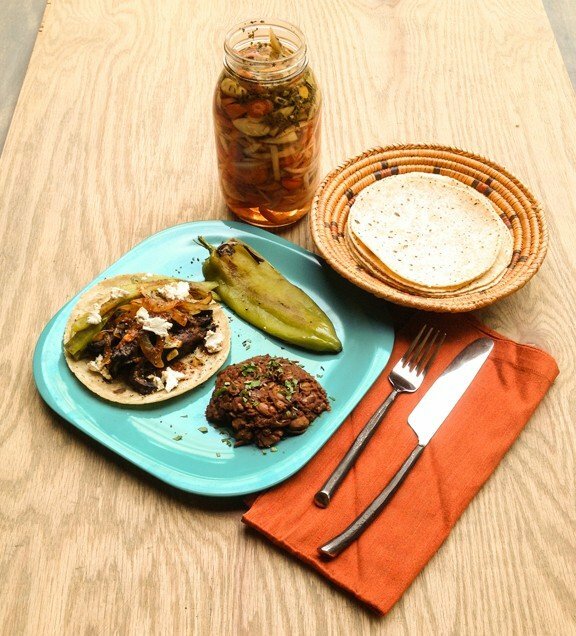 There’s grilled onions, diy vegan Mexican cheese, 22 salsas, a few sides and a few drinks to round out your meal. Sonoran cuisine has a strong affinity to the Southwestern U.S. and this taco is no exception. It uses a flour tortilla instead of the more typical corn tortilla. The preparation is very simple and straightforward, creating a taco with a few strong elements that create several layers of flavor in each bite. I’ve provided three variations, because I can’t decide which one is my favorite! If I have some extra time, I turn these into tacos de asador (tacos grilled over an open flame) and grill the filling instead of sautéing it. From Vegan Tacos by Jason Wyrick. ©2014 Jason Wyrick. Used by permission from Vegan Heritage Press. Heat the oil in a large skillet over medium-high heat. Add the onion and sauté until well caramelized, 8 to 10 minutes. Remove the onions from the skillet and return the skillet to the heat. Add the filling of your choice (either the beans, mushrooms, or seitan). Pintos: Lower the heat to medium. Add the beans and garlic to the pan and sauté for about 2 minutes. Season them with the salt and pepper, and then remove them from the heat. Portobellos: Keep the heat at medium-high. Add the portobellos to the pan and sauté for 4 to 5 minutes. Add the garlic about 1 minute before you are done cooking the mushrooms. Season with salt and pepper and remove from the heat. Seitan: Keep the heat at medium-high. Add 1 more teaspoon of oil to the pan. Add the seitan and sauté it for about 5 minutes, until it is well browned. Add the garlic and sauté this for 1 more minute. Season the seitan with salt and pepper and remove it from the heat. Warm your tortillas. Add the filling, followed by the sliced roasted chiles, then the salsa, and a scattering of avocado. You can cook the onions without adding any oil to the pan. Just sauté them over a medium high heat in a dry pan, stirring them every minute or so. 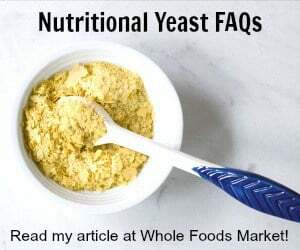 Once they are browned, add ¼ cup of water to the pan, give everything a quick stir, and then add your filling of choice, along with the garlic, salt, and pepper. Reduce the heat to medium and cook until the filling is done, about 2 minutes for the beans, 3 minutes for the mushrooms, and 3 minutes for the seitan. From Vegan Tacos by Jason Wyrick. copyright 2014 Jason Wyrick. Used by permission from Vegan Heritage Press. I love a simple bean taco with fresh toppings and, if I’m lucky, homemade salsa. I plus chick peas in the food processor and saute with diced onion and red pepper, add taco seasoning and that’s it very good! The book sounds interesting. We love tacos and it’s always fun to learn new ways of putting them together! I like the idea of all kinds of taco fillings. I usually do not use tortillas, but use taco-type fillings over potatoes or with other types of bread. Black beans, spanish rice, guacamole and hot salsa with cilantro! Can’t wait to peruse this book! It looks phenomenal. I’ll put pretty much anything in a tortilla, so new ideas would be appreciated. My tacos have corn tortillas, beef type crumbles, pinto beans, taco seasoning and shredded lettuce. I’m ready to branch out and try something new. 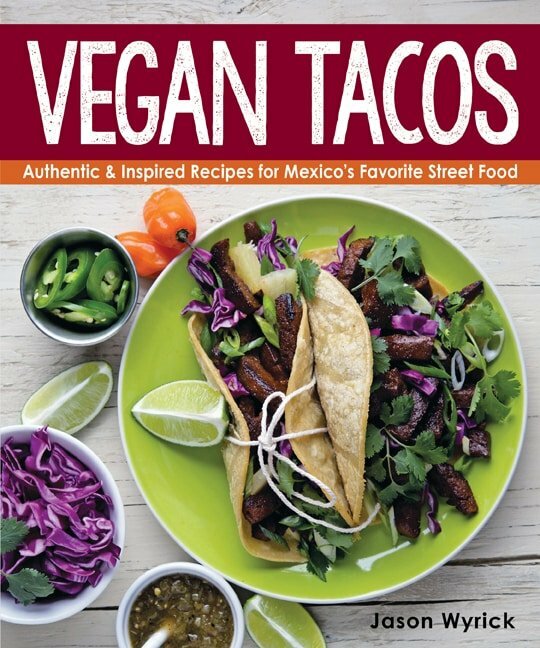 I generally have the ground soy product with a seasoning packet, some greens/lettuce and vegan cheese…I need inspiration for better, healthier fillings…this book would certainly be a thrill to have in my kitchen! We eat tacos a lot. It’d be nice to know how to switch them up besides our normal beans and sauce. This book looks good. For tacos I love baked tofu, fresh cilantro, salsa, beans, and a thinly sliced cabbage slaw! This looks great. I LOVE tacos of any (vegan) kind!! Lately I’ve been mildly obsessed with the following taco: baked lime/basil tofu, broccoli slaw, and lots of avocado on a corn tortilla. Love tacos! Can’t wait to try this recipe. I like the way the author gives notes on other ways to prepare the ingredients. They are really helpful. I love tacos! I soooo want this book! My tacos are usually horrifically basic. Tbh, usually just beans, salad and a lot of salsa. My go to is beyond crumbles, salsa, guac, and veggies…just simple. I’d love to try some of these for complicated recipes though. My favorite tacos have a smear of guacamole, grilled potobello mushrooms and tofu, slaw and mango salsa! Yum, now I am hungry for one! A simple black bean taco with avocado and salsa is probably the one I eat the most. I would love to have this book and get more creative! Thanks for the giveaway. I’m more of a burrito kind of guy but I guess it would be rice and grilled veggies and salsa. Mushroom tacos are my faves! Lots of roasted veggies & daiya cheese! On busy weeknights, Beyond Meat beef crumbles with all the fixings! Thanks for the awesome giveaway! Beyond Meat and Daiya cheese. Refried beans, vegan cheese, lettuce, salsa and avocado. Those look amazing! My go-to tacos have beans or baked tofu, avocado slices or guac, shredded lettuce or cabbage, onions, and some kind of sauce. I usually have beans on hand that I’ve made, so always bean tacos. I love hot peppers and have them dried in a pinch, with hot sauce too! It’s hard to keep fresh ingredients on hand but that would be my go to taco with minimum work, lol. The steamed white seitan and potato tacos from Viva Vegan are my favorite. I love lentil tacos! Even my omni family love lentil tacos.